I’ve recently taken a job at Ansible working on the enterprise offering Tower. In case you don’t know, Tower is a front-end for your Ansible playbooks w/ enterprise permission management. I was tasked with evaluating our database needs for a new System Tracking feature that we released. Working remotely at the time forced me to create detailed presentations on my progress and evaluation. I ended up taking the internal presentations and created a blog post about the evaluation process. So you want to get an instance of OpenStack running to poke around and see what all the fuss is about without going insane. Welcome to Devstack. Once Devstack is setup you will have access to a web-based control panel with prepopulated data and instances. You will also be able to explore the OpenStack API with v2.0 and v3 authentication (keystone). Create an ec2 elastic ip address and override the playbook variable ec2_elastic_ip. Be aware that the playbook may take > 20 minutes on an ec2 instance to complete. When finished you should be able to visit http://devstack.example.com and login using demo / nova_password. You should then see the webpanel similar to the image above. The v2.0 and v3 APIs are accessabile via http://devstack.example.com:5000/v2.0/ and http://devstack.example.com:5000/v3/. So things maybe didn’t go according to plan. Here are some playbook invocation variations that you can be used to execute a subset of the tasks. Do not provision a new ec2 instance. Only run the devstack install task. Do not provision a new ec2 instance nor run the devstack install task. Only run the vm instance creation tasks. 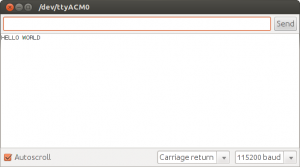 We can install Ubuntu 2-ways. Installing to the internal MMC requires an SDCARD to install, but the sdcard is not required after that. The process is mostly the same. The MMC setup vs. the SDCARD setup depends on which image you download. Insert the sdcard into your desktop and note the device path. In my case the device is at /dev/sdc. Flash the image to the sdcard. Substitute <mmc_or_sdcard>.img and /dev/sdX accordingly. If you plan on powering the beaglebone with usb, ensure the ethernet is unplugged. Once all the lights turn solid blue the MMC is successfully flashed and you may power down your beaglebone (unplug the power), remove the sdcard. Wait a couple seconds, then plug the power back in and the system will boot Ubuntu. Find the ip of your beaglebone on your network. Host is up (0.00086s latency). Host is up (0.076s latency). Host is up (0.065s latency). Host is up (0.00023s latency). Host is up (0.075s latency). Host is up (0.062s latency). Host is up (0.017s latency). This tutorial will explain how to communicate from the Raspberry Pi to an MSP430 Launchpad board (M430G2553 chip) using SPI. Your raspberry pi should be running the newest version of Raspbian. To ensure your system is up-to-date please download and run rpi-update. Flash the below code to your MSP430 chip. 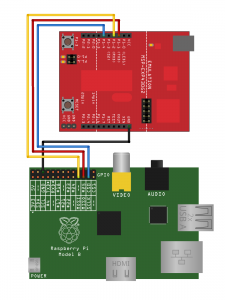 Please see this tutorial for information on compiling and programming your MSP430. //   slaves RST for complete reset. With your updated rasbian system you should have the drivers that you need. Now it’s time to load them. * Copyright (c) 2007  MontaVista Software, Inc.
puts("  -D --device   device to use (default /dev/spidev1.1)\n"
"  -s --speed    max speed (Hz)\n"
"  -d --delay    delay (usec)\n"
"  -b --bpw      bits per word \n"
"  -H --cpha     clock phase\n"
"  -O --cpol     clock polarity\n"
"  -L --lsb      least significant bit first\n"
"  -C --cs-high  chip select active high\n"
The MSP430 board LED1 will blink 3 times upon recognition of the SPI clock. After this initial sequence, when you SPI data “HELLO WORLD\n” to the MSP430 it will turn on the LED1 light. On your Raspberry Pi run the previously compiled program. The -s options sets the frequency of the clock when performing the SPI communication. 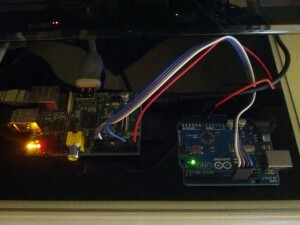 Again, a successful sending of “HELLO WORLD\n” will be denoted by LED1 lighting up on the MSP430 board. 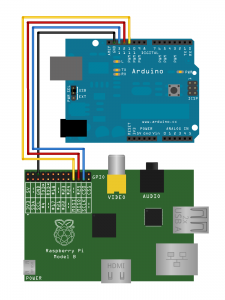 This tutorial will show you how to communicate from your raspberry pi to your arduino using 3-wire SPI. Open your Arduino ide and flash the below code to your Arduino. * Send arbitrary number of bits at whatever clock rate (tested at 500 KHZ and 500 HZ). * the captured byte stream via the serial. You should see HELLO WORLD print in the Arduino IDE Serial Monitor. 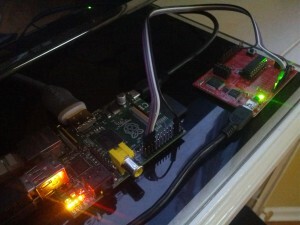 drwxrwxr-x 2 pi pi 4096 Aug 10 10:53 .
drwxrwxr-x 23 pi pi 4096 Aug 10 10:53 .. Thanks to Nick Gammon for the SPI slave code. Thanks to Anton Vorontsov for the kernel Documentation spidev_test.c example code.